Two devastating hurricanes slowed down, but could not derail the fund-raising momentum of the regionâs largest cancer care and awareness event. Hurricanes Irma and Maria curtailed fund-raising activities and caused the cancellation of walks in five of 17 English and Dutch speaking territories where CIBC FirstCaribbean International Bank holds its annual Walk for the Cure activities. Despite that setback, the hard work of hundreds of volunteers from across the bank, in partnership with various cancer care organizations and over 160 corporate sponsors, raised a just over US$450,000. This brings the total funds raised through this initiative over the past six years to US$1.75 million. Walks took place across the Dutch and English speaking Caribbean where the bank has a presence, except for Anguilla, British Virgin Islands, Dominica, St Maarten and Turks and Caicos Islands, which were hardest hit by the hurricanes. 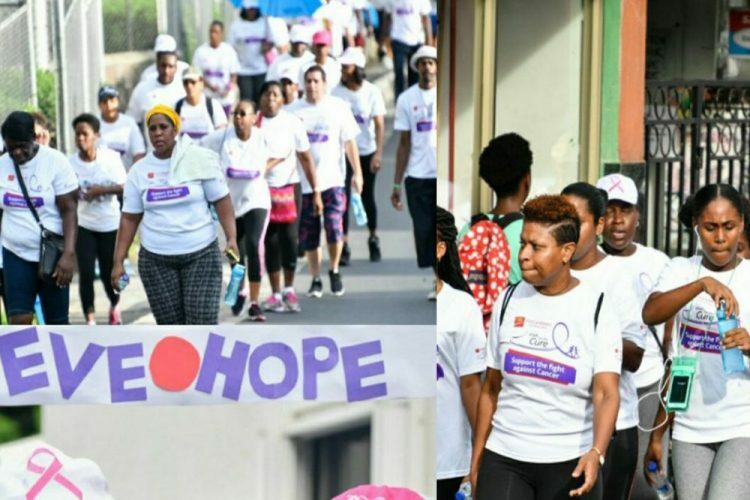 Thousands took to the streets primarily on the first weekend in October, dressed in white or pink T-shirts to walk and run to raise awareness of the various cancers and their impact on families. âThe commitment to this project which our employees have exhibited over the years is nothing short of remarkable. They do this on an entirely voluntary basis â along with the rest of their work â and every year we are astounded by what they are able to achieve. Likewise, our list of corporate partners continues to grow every year, as more businesses join us in our fight against cancer,â said Torzsas, who is also managing director, Cards & Customer Relationship and Management. âWe are thrilled to mark another successful Walk for the Cure; we were able to raise a significant amount of money, which will assist those battling cancer and their families. Just as important, we were also able to continue to spread the message of education and early detection, as two of the most potent weapons in the fight against the disease,â said St Hill, managing director, Retail and Business Banking. This year, CIBC FirstCaribbean in St Vincent partnered with FLOW, Going Places Travel, Orchard, Arabasque, Chill Spot, Searchlight, ECGC/JU-C, Quik Cash, FAC, TATA Consulting Services and VISA to stage the Walk for the Cure. In St Vincent, the Walk was held on Saturday, September 30, 2017 at 4 p.m., starting from the bank yard, along the Leeward Highway to the Lowmanâs Leeward Anglican School and back to the bank yard. Walk manager Jacintha Hinds thanked the sponsors, participants and all supporters for another successful participation and highlighted that just over XCD$34,000 will be presented to the 2017 beneficiary, SCORCH. Funds raised are used to provide assistance, care and counselling to patients and their families, as well as to raise awareness through education campaigns across the region. They also help the various organizations to assist with the purchase and maintenance of equipment used in the diagnosis and treatment of cancer patients. The regional walk is held to coincide with the Canadian Breast Cancer Foundationâs CIBC Run for the Cure, sponsored by the bankâs parent company, CIBC. CIBC has been supporting this event for 21 years, donating millions to breast cancer research in Canada.